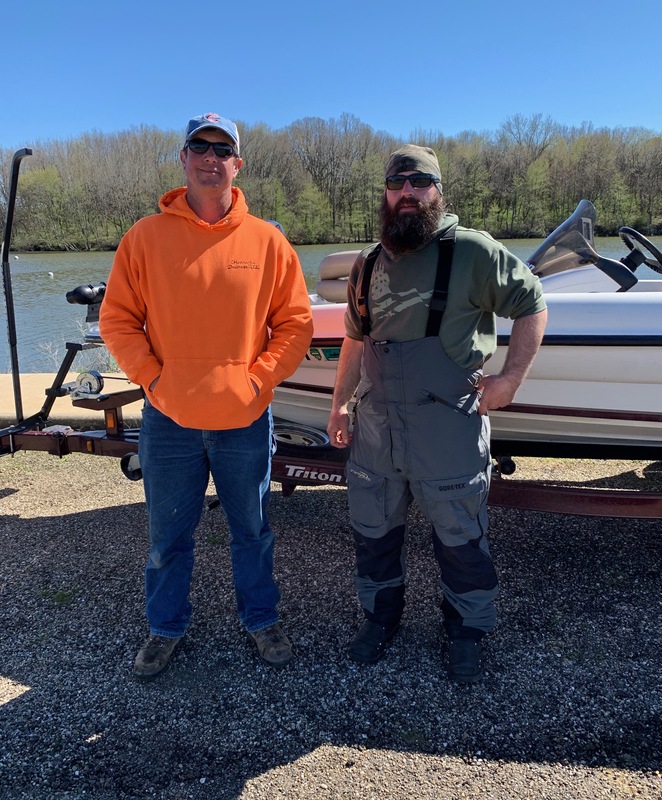 The first tournament of CICC is in the books. 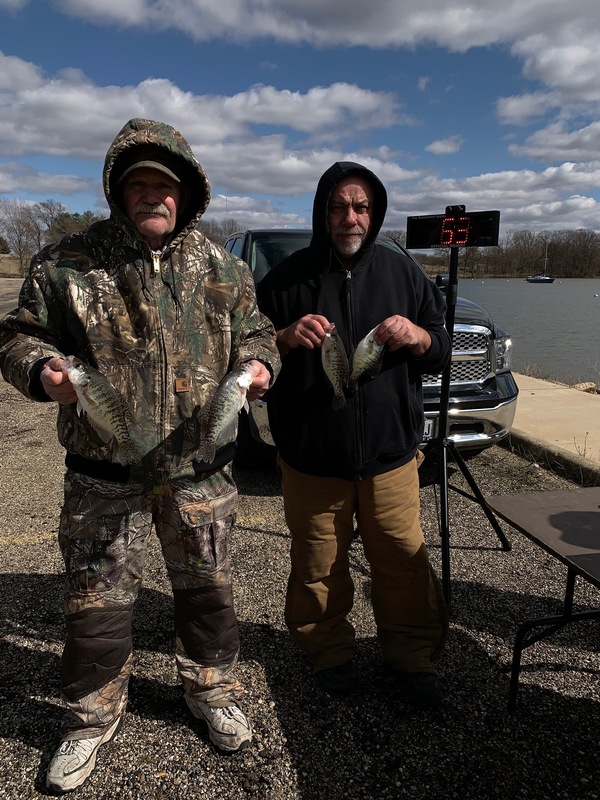 On a chilly Sunday morning, shortly after the advance of a cold front, 20 boats entered the tournament. The consensus at launch was that the weights would be somewhat low. 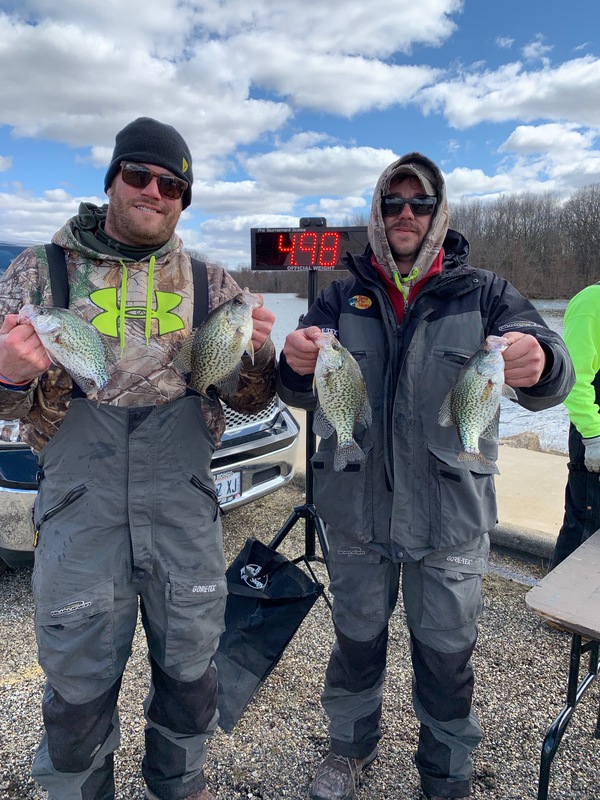 The participants did quite well, however, with more than half of the field weighing in excess of 4 pounds. 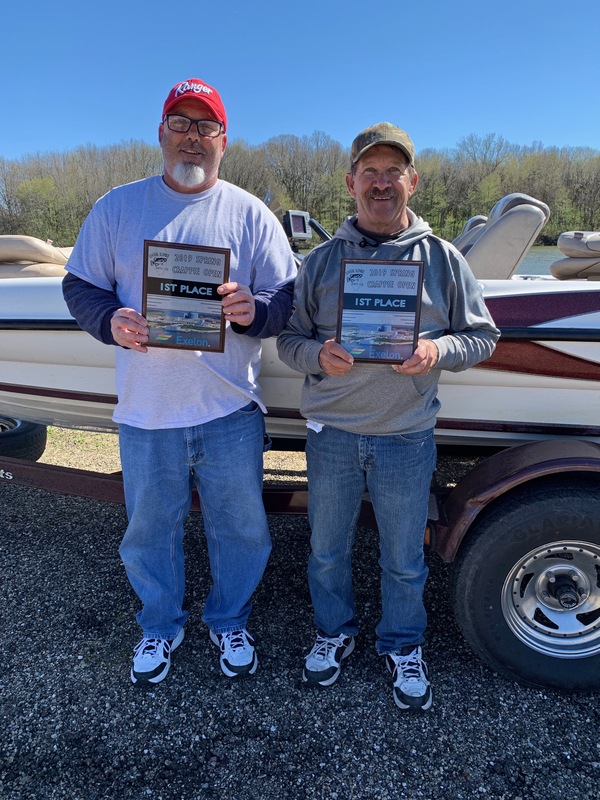 The winning weight also broke the 5 lb barrier with the team of Rich and John Goodbrake weighing 5.47 pounds. 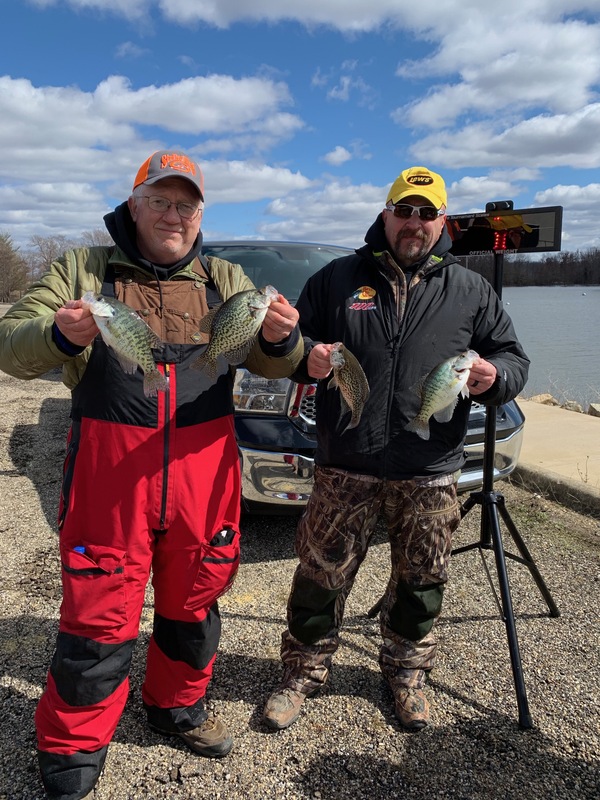 Brian Cleveland and Terry Davis weighed 5.02 lbs of crappie for second-place. 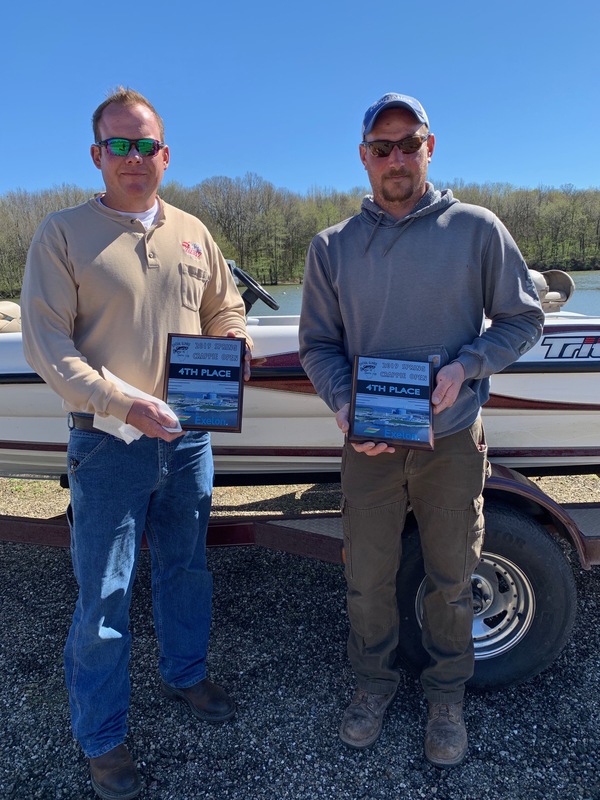 Third place went to the team of Josh Nash and Dustin Reynolds with a weight of 4.98 lbs. 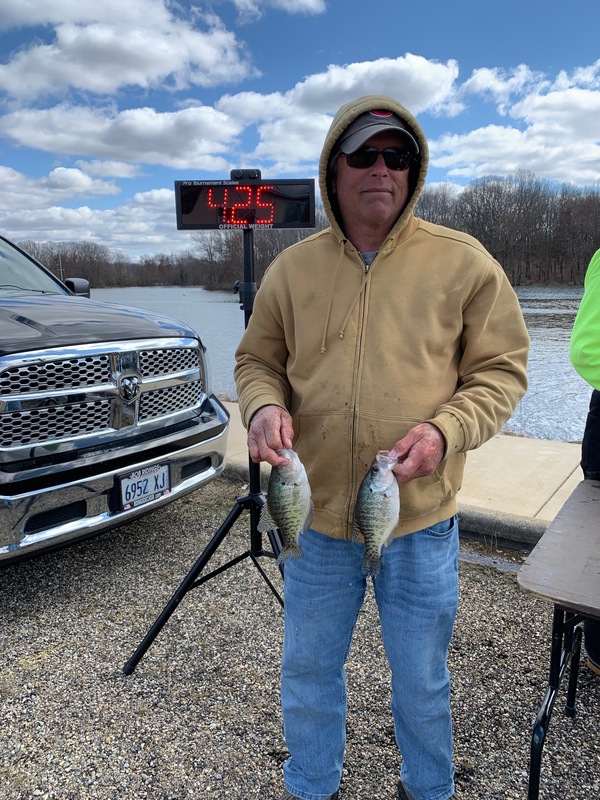 Andy Roberts brought in 4.59 lbs for fourth place. The only minor competition of the day was apparently for 10th Pl. with three teams within 0.01 lbs of each other. 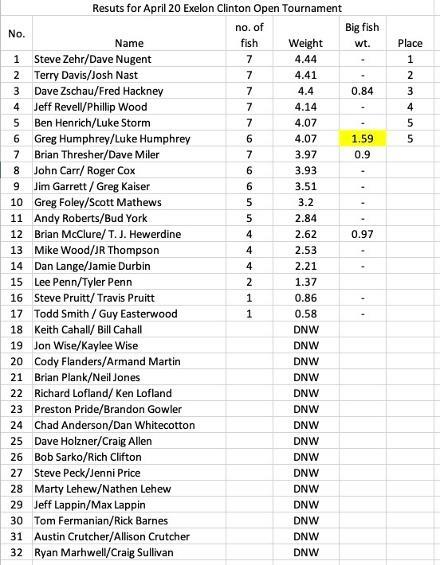 Unfortunately, the team of Marty Lehew and Kevin Scoles were originally missed and will be rewarded $35 for 10th Pl. 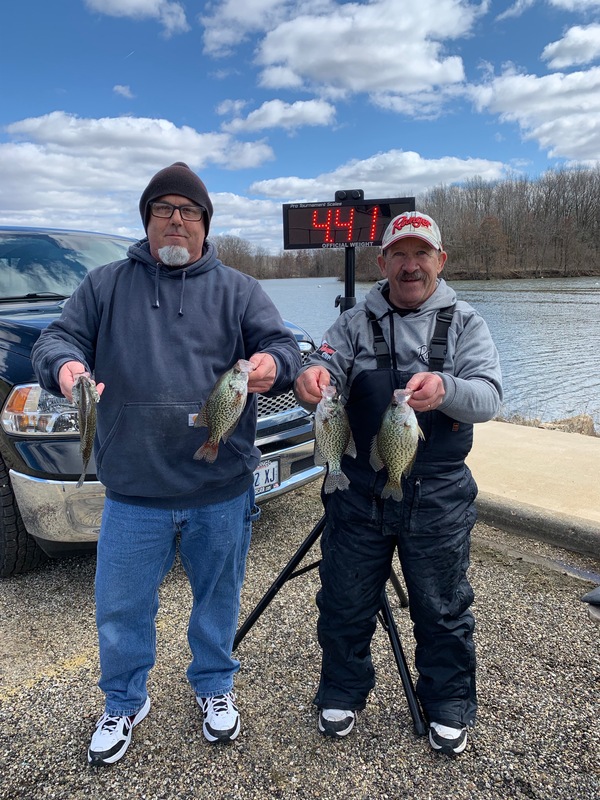 The next club event will be at Lake Decatur on April 14. 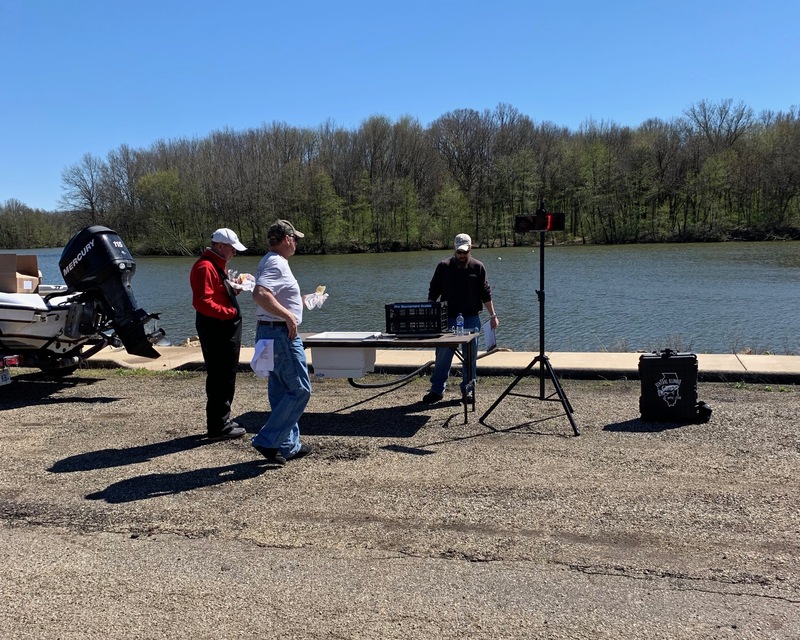 Hopefully it will be a calm sunny day and participants will break current club records. 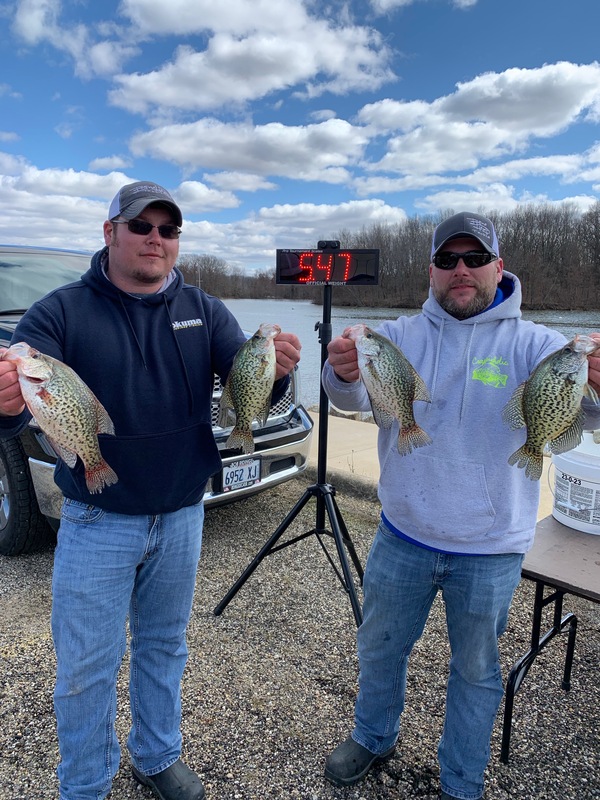 Before we announce the winners, the Central Illinois Crappie Club sincerely thanks the Exelon Corporation for their tremendous support and sponsorship of this event. 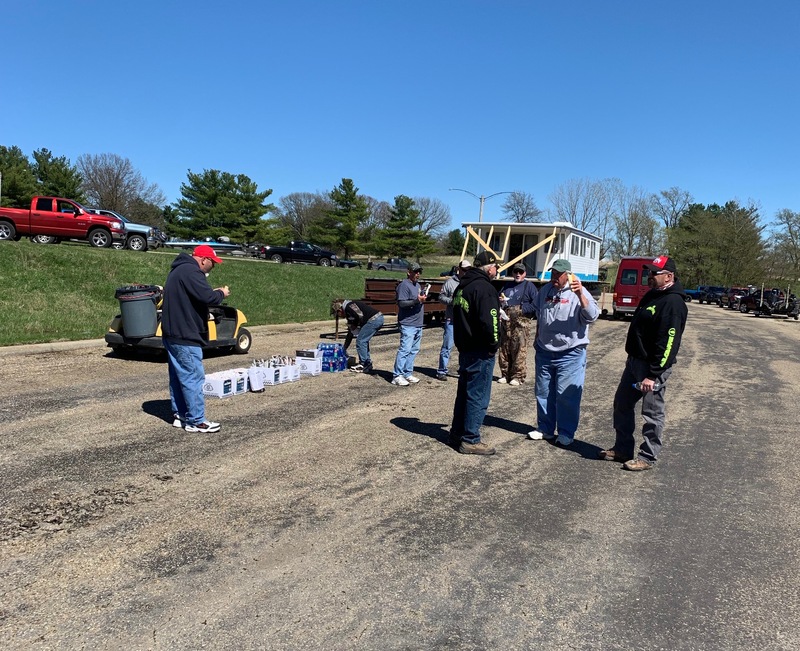 Exelon (Kathleen Brewer) provided lunch at the weigh-in and made sure that everything went well for the day. 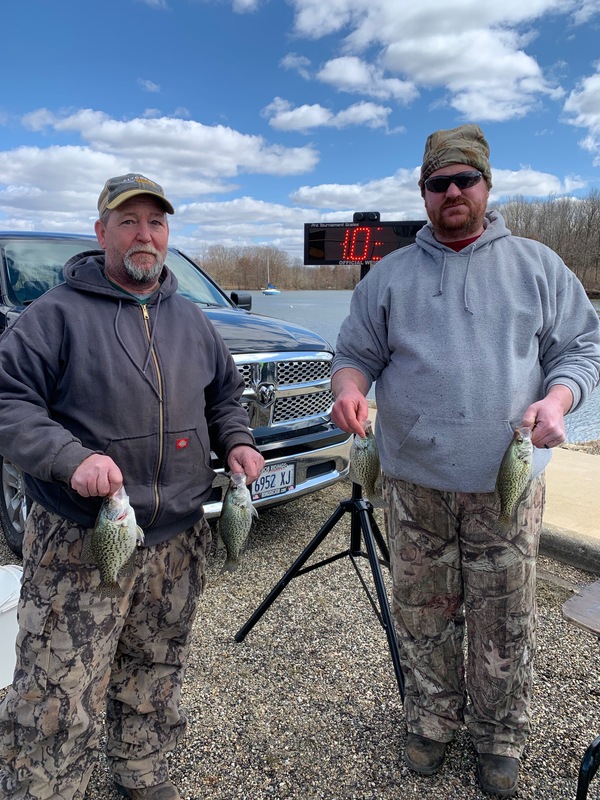 To say it was a tough day fishing is a gross understatement. 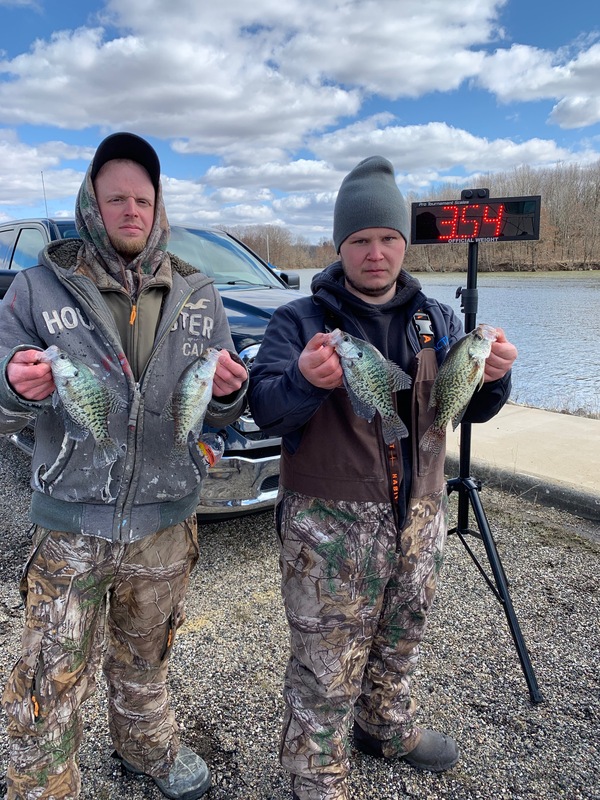 Winds generally blew out of the northwest at 15-25 mph but seemed to change directions regularly. 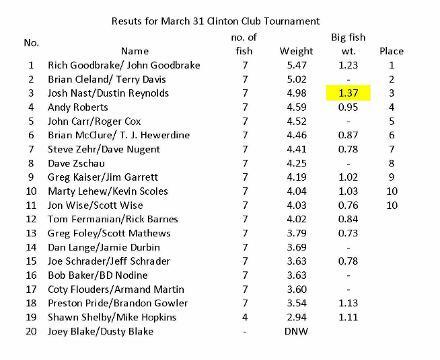 Of the 32 registered boats only 17 brought fish to the scales. 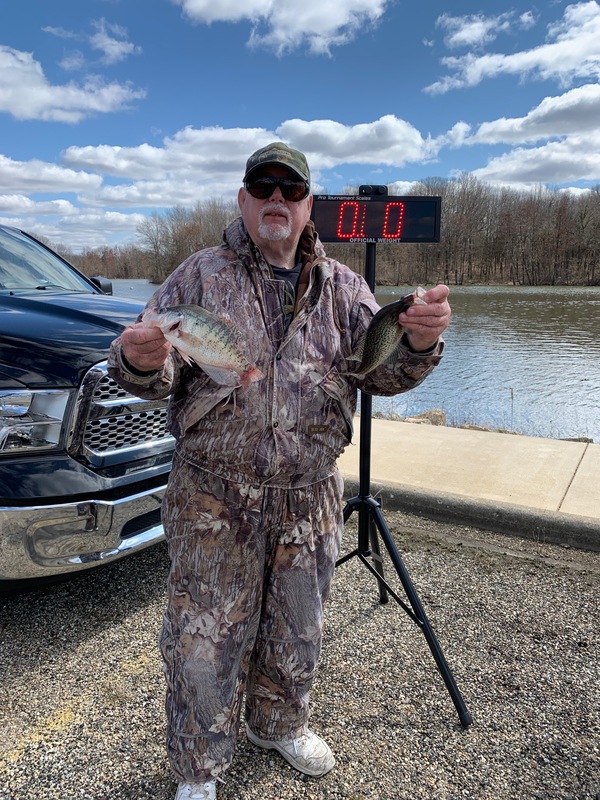 Only 6 teams presented 7 fish. 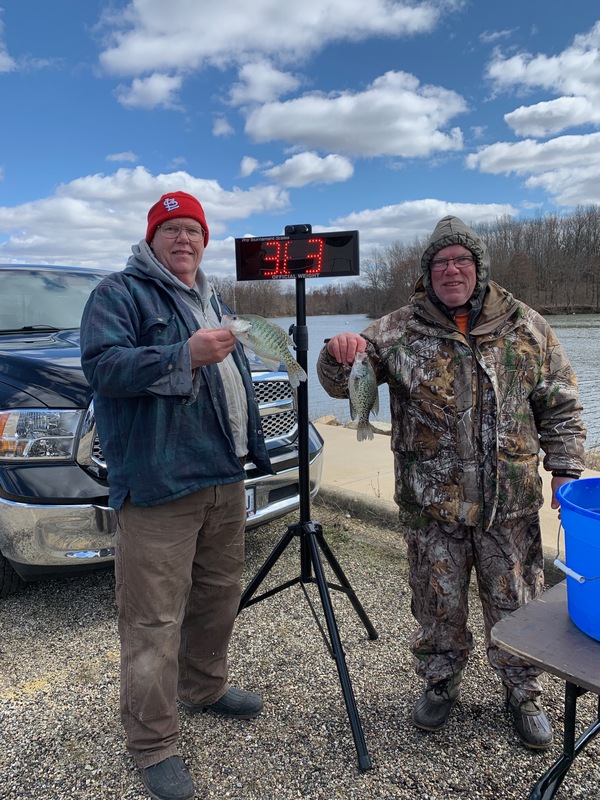 Steve Zehr and Dave Nugent were the winners with a 7 fish weight of 4.44 lbs. 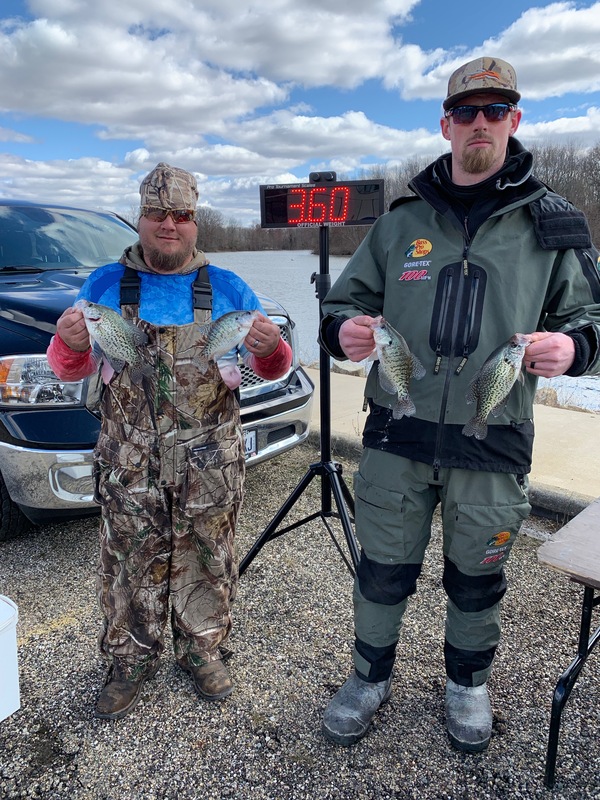 Second place was not far behind with Terry Davis and Josh Nash weighing 7fish at 4.41 lbs. 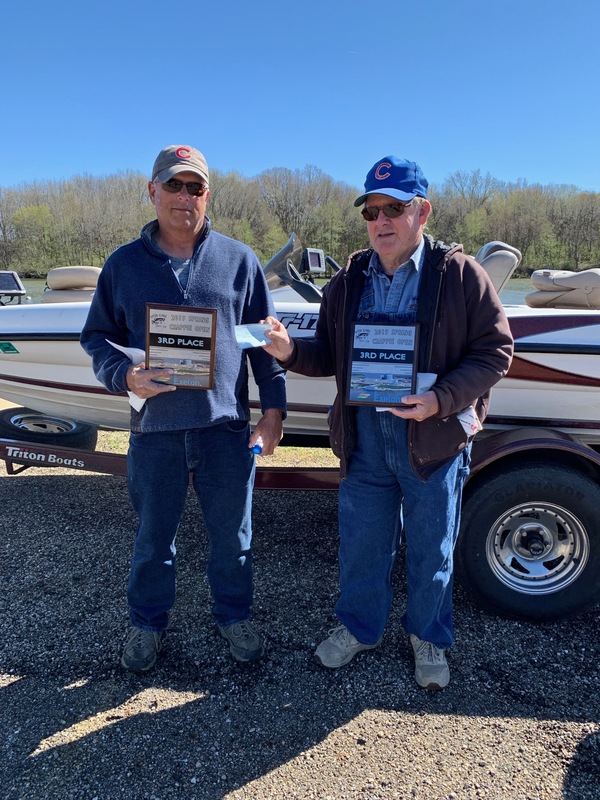 Third place went to the team of Dave Zschau and Fred Hackney with a weight of 4.40 lbs for 7 fish. 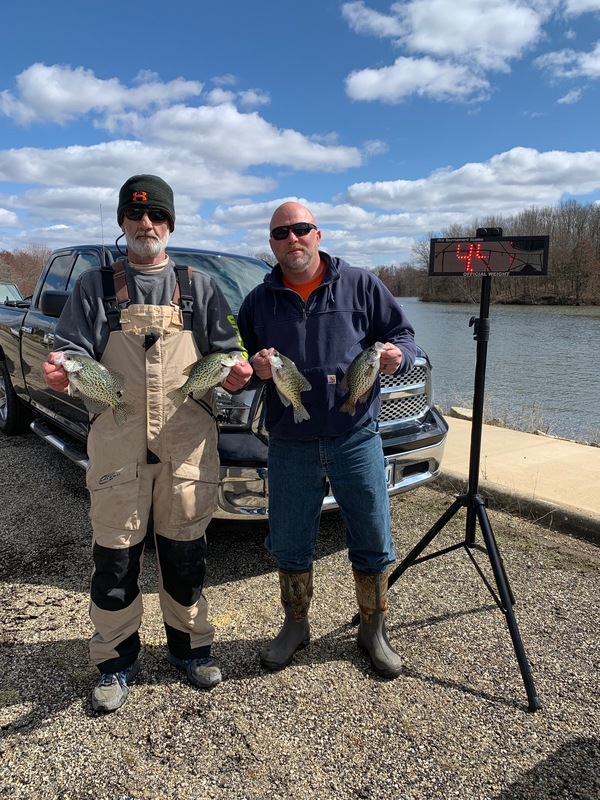 Jeff Revell and Phillip Wood had 4.14 lbs for fourth place. 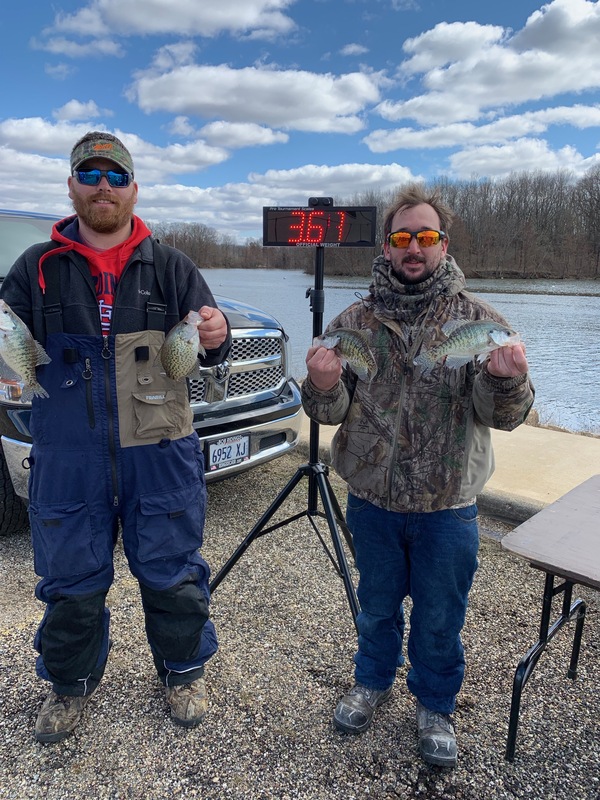 There was a tie for fifth place with the teams of Ben Henrich and Luke Storm and Greg Humphrey and Luke Humphrey at 4.07 lbs. 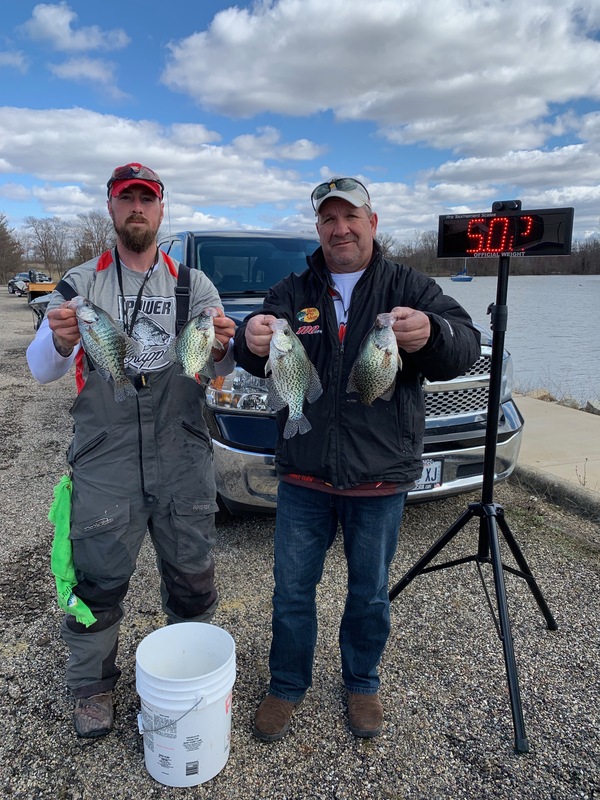 The team of Greg and Luke Humphrey also brought in the big fish of the day at 1.59 lbs. 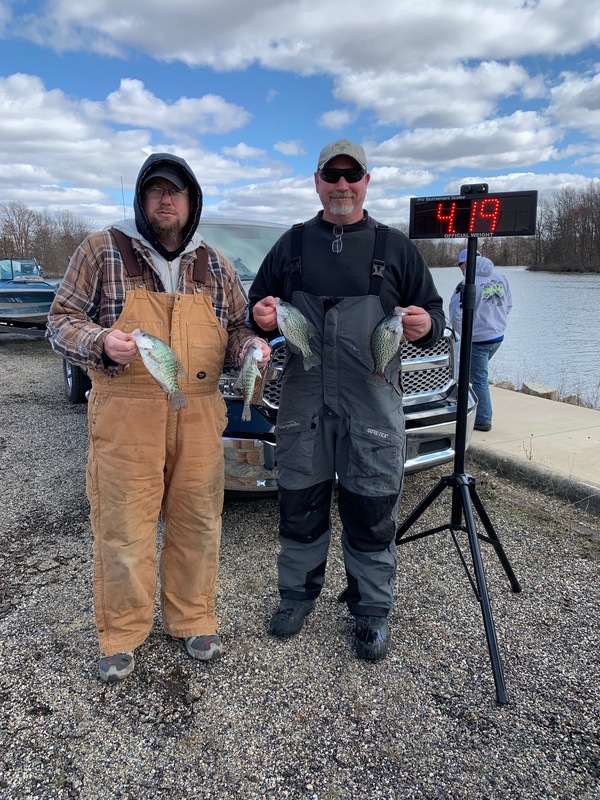 Despite a chilly, windy start to the tournament everyone seemed to enjoy the competition and fellowship. 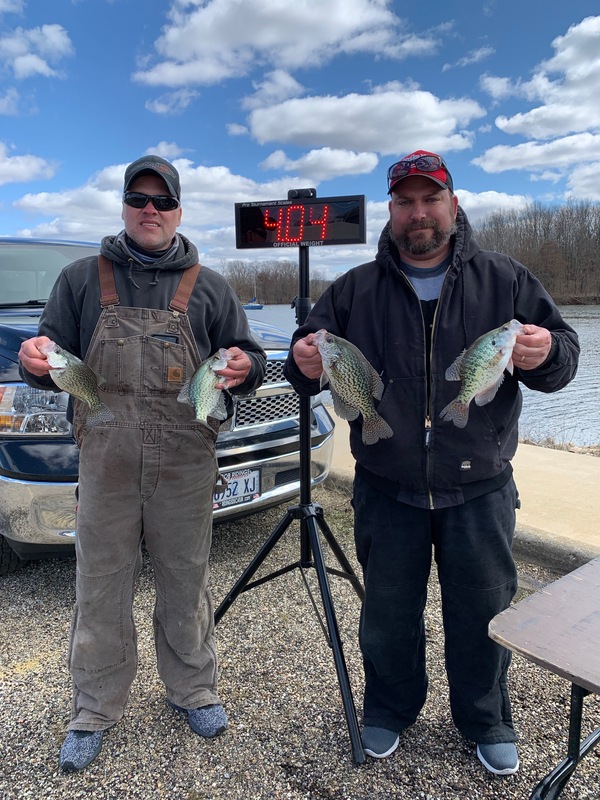 Our next tournament is currently scheduled for Saturday, May 11 at Lake Mattoon. 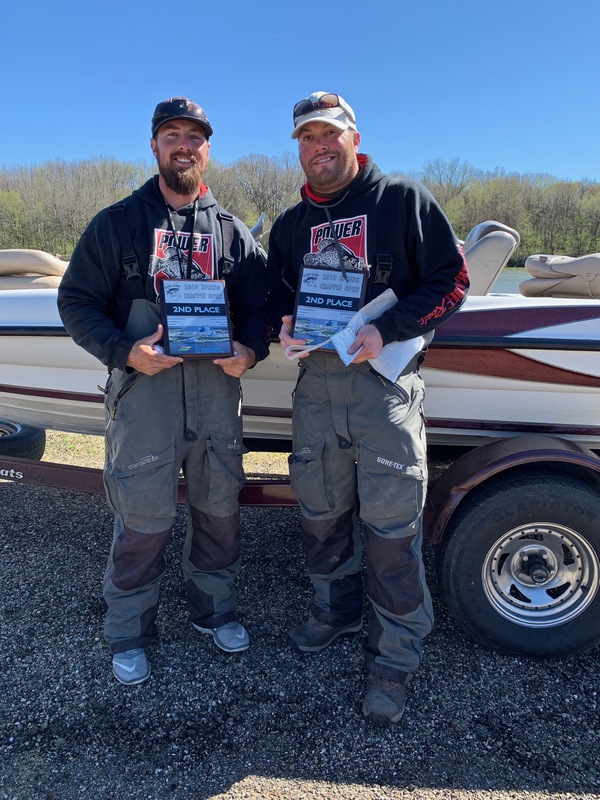 This is a club tournament with the results adding to the Angler of the Year Competition. 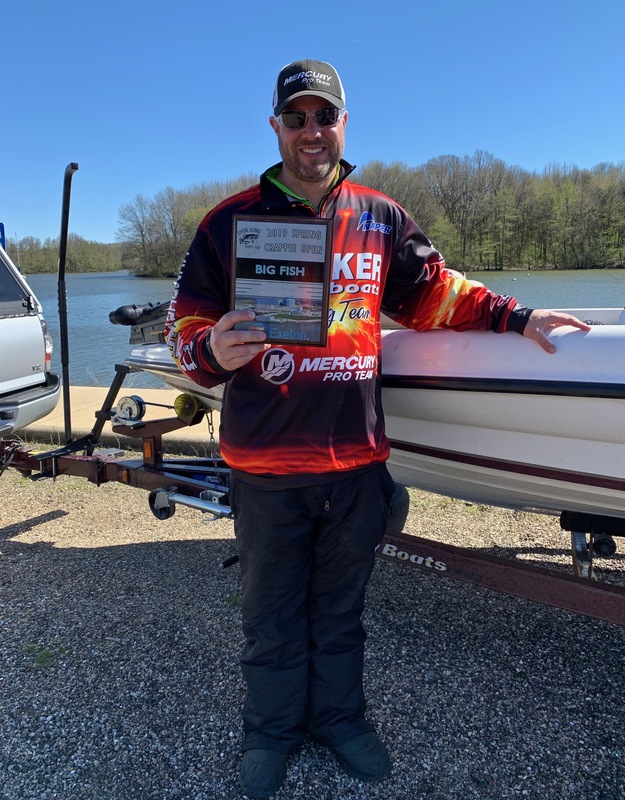 The next mega tournament is on Lake Shelbyville on Saturday, May 18 with a $1500 first prize.